Our experienced dental team is here to make you comfortable from the moment you decide to make an appointment. Jennifer Guzzetta, Lisa Chase, and Catherine Suarez have more than 60 years of combined expertise. We make every effort to see that Coleman Dental adds to your brilliant smile, from scheduling your first appointment to following up after the procedure. We are here for you every step of the way. 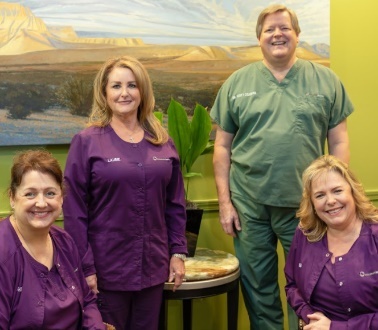 Having worked together for more than 17 years, our dental team shares a commitment to providing an attentive and comfortable patient experience. Whether you’re interested in scheduling a consultation with Dr. Coleman to discuss cosmetic work or need to make an appointment for general dentistry, our team of professionals is ready to assist. Jennifer is one of the first smiles you will see when you walk through the door. She is the Business Manager, Financial, and Treatment Coordinator. After you meet her for the first time, you will understand why she is considered the “office diva.” It is Jennifer’s job to make you love coming to the dentist. She has been serving patients for over 25 years and has had the privilege of working for Dr. Coleman since 2008. As a key player on his team, it is her main goal to treat every patient like family. In her spare time, Jennifer enjoys spending time with her five beautiful grandchildren. For relaxation, she loves to do floral design and interior design, along with gardening. She loves to travel, is a native Houstonian, and cherishes her faith and family. Being Italian, when life gives her lemons, she makes Lemoncello. Ciao! Catherine is Dr. Coleman’s hygienist. She is the newest addition to our dental team. Catherine graduated from Lamar Institute of Technology in Beaumont, Texas in 2008, with her degree in Dental Hygiene. Catherine has worked in several areas of dentistry and has over 30 years of experience. She loves providing preventive care to patients, as well as treating periodontal disease. The best part of her job is developing relationships with new patients on a daily basis. Catherine is a transplant from the Beaumont/Orange area and enjoys seeing all this great city has to offer. She loves spending time with her two children and her spoiled dog, Mel. You will have a painless, relaxing experience whenever you are in to see Catherine. Lisa is Dr. Coleman’s assistant, also referred to as his side-kick. She has been a Certified Dental Assistant for over 25 years and has attended numerous continuing education classes. Lisa’s experience, knowledge, and remarkable chairside manner make patients feel like they are in the very best of hands. Lisa has been married to her husband for 22 years and they have one son. As a family, they enjoy cooking together, fishing, and camping. Lisa is always available to help patients with any concerns they may have.